Long-lasting and natural, with a variety of appealing fragrances, these olive oil soaps are handcrafted by Orthodox monks in the Hermitage workshop. Each bar is 3.5 oz. Lavender: The monks tried many different lavender essential oils before discovering this one, which is the most floral of all lavenders. Wild Rose: At once bright and delicate, this fragrance captures the soft, sweet aroma of bedewed roses. White Lilac: Brings you the soft, sweet scent of freshly blooming spring lilacs year-round. Aspen Woods: A deep and intriguing fragrance with a mix of warm, woodsy notes complemented by spices of cinnamon and clove, sweetened with vanilla musk and balanced with notes of fresh eucalyptus and orange blossoms. Blackberry Sage: A wonderful mix of fresh, tart blackberries, sage leaves, a hint of cedar, and some sweetness to round it off. This fragrance is invigorating and bright. Vanilla Bean: A luxuriously rich blend of vanilla, cream and caramel. This sweet fragrance is warm and comforting. The Hermitage of the Holy Cross is an English speaking monastery under the jurisdiction of the Russian Orthodox Church Abroad and is a dependency of Holy Trinity Monastery in Jordanville, New York. 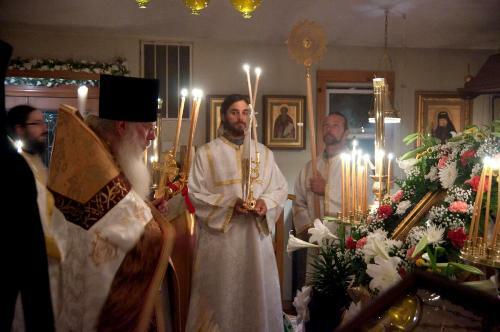 The monks support themselves by manufacturing hand-rolled incense in the ancient Athonite tradition and through hand-painted icons, homemade soap, wooden icon shelves, analogions (prayer desks) and other liturgical items and products. Holy Cross Monastery was founded in September 1986 by Hieromonk Kallistos in House Springs, Missouri. The Hermitage remained in the Missouri area for the next 14 years. An offer of land was made to the Hermitage and with the blessings of the monastery's Abbot, Archbishop Laurus of Holy Trinity Monastery and the monastery's spiritual father, Igumen George, the brotherhood decided to move the monastery to West Virginia in 2000. Apr 19, 2016 | By Pamela F.
The scent on these bars of soap are not only pleasing to men, but the lady of the house loves them too! Very nice for washing hands. My Dad loves these and I order twice a year along with Monastery Greetings Men's afterhave cream.